These templates usually have a limited number of glitches: using them repeatedly in the same video could come off as repetitive. Now here is the solution: it is called Glitch Composer! Glitch Composer is a powerful tool for After Effects for creating infinite glitch effects on your footages. It is always on hand, intuitive and, above all, it doesn’t require complex customizations. The usage of the script is very simple: you just have to choose and combine different distortion effects and press the “generate” button; the glitch will immediately be created and placed on your composition. 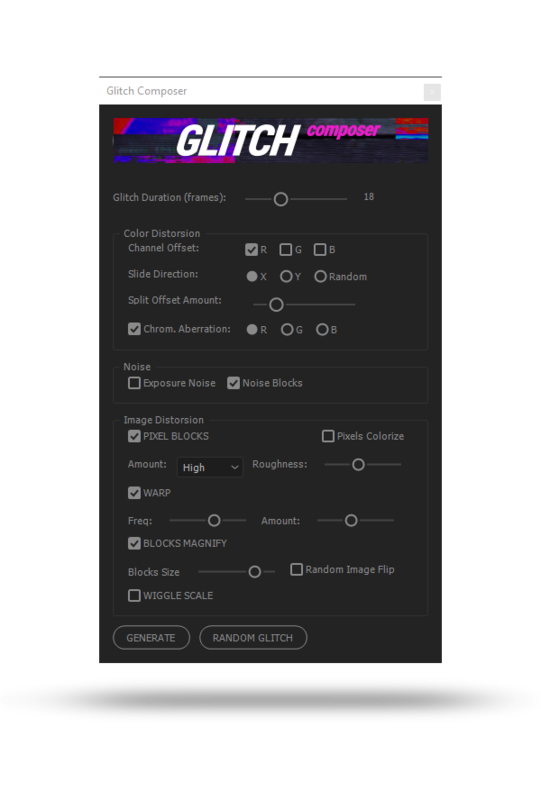 And if you are lazy, or you need to speed up your workflow, you can leave the glitch creation task to the script: press the “Random Glitch” button and the script will create a glitch using random effects with random parameters. This way you can create infinite, different and unique glitch effects! Again, you can overlap the glitches created on your composition, generating other original image distorsion effects. This product is cross platform: it works on both PC and MAC, with all AE versions from CS5 to above.